The Boise .NET User Group was kind enough to invite me to be a presenter. Boise is a bit too far away for me to make it there on a weekday on a small budget, but they were accomodating enough to allow me to present remotely. There were a couple minor technical issues, but mostly it went well. Even though I've done this presentation a lot, Brian cajoled me into talking about INotifyPropertyChanged, which is something I've only done once before during this talk (usually I'm constrained for time, or the group isn't interested in the MVVM pattern). Slides and code are available in the AOP For You and Me GitHub repository. I first used MvvmCross with Windows Phone 8, and XAML has a pretty good data-binding syntax already in place. Switching over to Android, though, and the data binding didn't seem as straightforward. I was struggling just to bind a Button to an IMvxCommand. Note that the .For("Click") clause is actually optional, since "Click" seems to be the "default view property". But I chose to be explicit, especially for this example. I'm continuing my adventures into mobile development this year. I've spent a lot of time on Windows Phone 8 so far, and as I'm writing this post, I've shipped an app off to a couple of friends to try on their real phones. 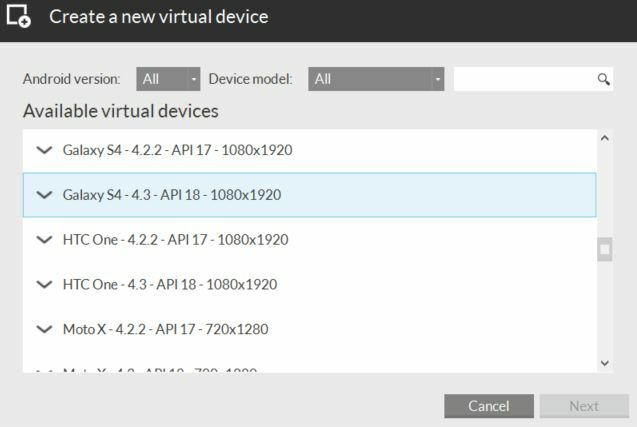 Next step, since I'm using MvvmCross, is to take that codebase and use (most of) it to create an Android version of the same app using Xamarin. I've done Android development before, both with plain Java and with Xamarin (called MonoDroid way-back-when), and either way a major pain point has been the Android emulator. It's slow, clunky, and cumbersome, and everyone knows it. 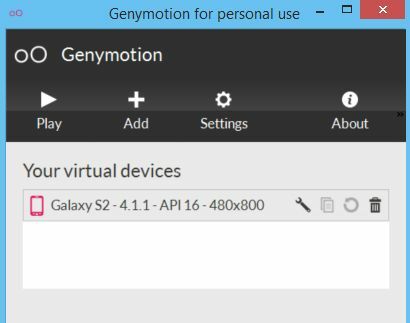 Fortunately, Greg Shackles, Xamarin MVP and all-around great guy, heard my whining and recommended that I check out Genymotion (which I had never heard of). And, behold! Genymotion is just what I've always wanted. It can create and spin up Android emulators for me using VirtualBox. The prices are very reasonble, and there's even a free version that is no slouch! I installed it, and it was even kind enough to install VirtualBox for me. Once it's installed, you can select from a whole bunch of pre-configured Android devices (Galaxy S4, HTC One, Moto X, etc). I decided to create a Galaxy S2 image (which is the phone I actually own and use everyday). Then, just click that "play" button, and a reasonably fast Android emulator will start up. Both Xamarin Studio and Visual Studio with Xamarin discover it, no problem. I assume Eclipse will also be able to find it. If you're doing Android development, do yourself a favor and give Genymotion a try. P.S. It's pronounced "Jenny motion"